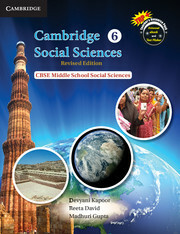 Cambridge Social Sciences is a Social Science series for classes 6—8. 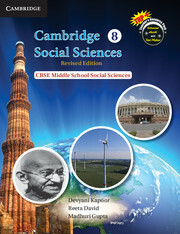 Cambridge Social Sciences is an integrated CBSE Middle School Social Science series in History, Geography, and Social and Political Life for classes 6 to 8. It conforms to the curriculum specification laid down by the National Curriculum Framework (NCF 2005) prepared by the NCERT. 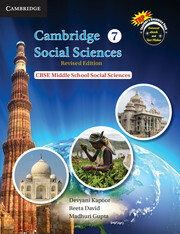 The revised edition of Cambridge Social Sciences comes with many new activities and a modern learning approach to make Social Sciences come alive and engage the young learner in a whole new way. Learning Objectives outlines the key topics of the chapter. Set Sail includes interesting questions from daily life leading into the chapter. Info Capsule provides additional interesting information on the topic. Vocab Help provides meanings of contextual terms. Global Connect gives interesting information on events in other parts of the world. Tasks gauges learner’s comprehension of the topic. I learnt is a brief summary of all important points covered in the chapter. Exercise provides questions to assess the knowledge of the concepts learnt including HOTS (Higher Order Thinking Skills) questions. Life Skills questions in each chapter will develop co-scholastic abilities of the student.